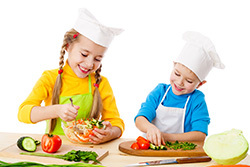 How Can Kids and Healthy Eating Go Together? With the busyness of life, kids and healthy eating seems to be a thing of the past especially with fast food options around every corner. Consumers can buy complete meals in a bag ready and waiting at the grocery store promising to be ready in less than 20 minutes. Nice, right? Quick! Loaded with tons of preservatives, these foods are depleted of almost all nutritional value. With skyrocketing obesity rates among our youth as well as adults, I am not sure we can afford physically and financially not to slow down and make lifestyle changes in us and our family as a whole. Teenagers and healthy eating are even less of a mixture these days. Believe me! I understand. I have one entering high school this year and in band. It involves a rigorous practice schedule including 3 hour nightly practices. With 2 other children in the family, each involved in extra-curricular activities, it proves very challenging to practice the combination of kids and healthy eating. Quickie meals happen on the run to practice or eating after nine oclock. I get it. Moms, this is the age of empowerment. They are adults dont you know that? Or so they think. Ask them what kind of snacks and foods are their preferences. If they are healthy choices great! If not, use this as a teaching not preaching moment and guide them. Give them alternatives to the bad choices and explain to them the importance of what kids and healthy eating means to their future health. This age group no longer buys the do as I say not as I do recital. They are watching if you walk the walk, in more ways than one. If they see you making healthy choices, they will respect more so what you are trying to speak into them concerning the same. Teen or toddler here are a few recipes to try. Eating healthy can taste good! Add this one part of your kids and healthy eating collection. Cook pasta according to package. Combine flour and milk in a small pot and mix. Cook for a couple of minutes over medium heat, stirring constantly. Add salt, pepper and cheese and stir. Add cooked pasta and mix well. Run bread through food processor or chopper and heat in skillet until lightly browned. 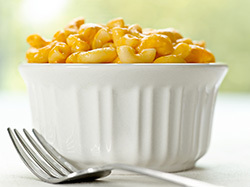 Sprinkle over Mac and Cheese mixture and serve. 4 servings. Salt and peeper ground meat or turkey and mix well. Form 8 patties and place on preheated grill or boiler or for a quicker easier cook, place on non-stick preheated skillet over med to high heat. 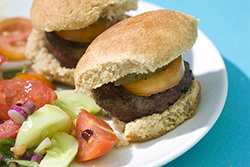 Cook until desired degree of doneness, Assemble burger with condiments, half a plum tomato and romaine lettuce. Serve with homemade fries. Dont force kids to clean their plates. Teach them portion sizes. Limit but dont ban fast food and low-nutrient snacks. Emphasize lean proteins at every meal. Processed or not, choose whole grain! Work fruits and vegetables into at least 3 meals or snacks a day. Limit sugary drinks. Have filtered or bottled water on hand. Send school lunches or at least monitor cafeteria choices. Be aware of what they are eating. You cant win the battle over the battle. Food can very easily become a source of conflict especially in the older ones. The best strategy is to give them some control but limit what is available. Plan to succeed by making your home a “kids and healthy eating friendly zone but with some kids choice options as well!